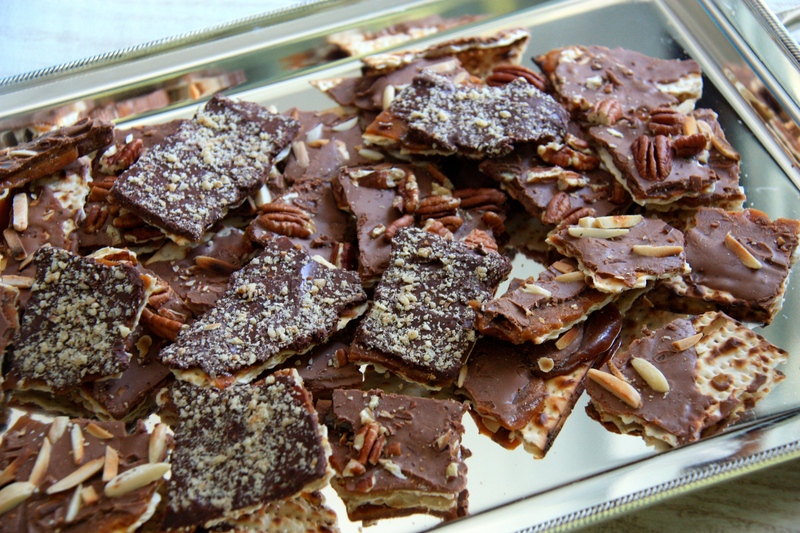 This recipe is a staple for many seder nights thanks to Marcy Goldman. My entire family dreams of eating these treats all year round. With a few alterations and additions, this is sure to be a hit at the seder table. Happy Passover! In a sheet pan, covered with foil or parchment paper, lay out the matzoh to fit the pan. Combine the sugar and butter in a medium saucepan with a pinch of salt over medium high heat. Stir until the sugar dissolves. Bring to a boil and boil until a candy thermometer reaches the temperature known as the hard crack stage, or 298 degrees F. Immediately remove from heat and pour over the matzoh. Using a spatula, quickly smooth it to cover the matzoh. It will begin to harden immediately. Set aside. Sprinkle the chocolate chips over the caramel top and let sit for 2-3 minutes. Chips will melt quickly and you can smooth the chocolate over the caramel. Sprinkle with desired nuts and let cool for a couple hours. It is important to have a candy thermometer inserted into the mix to make sure it is the correct temperature to achieve the trademark snap of a brittle.